Don't forget to enter the contest! The drawing is Monday! I am a complete putz, and forgot to mention that the cookies from Annie over at The COTFU Blog arrived a week ago!!! Mmm... the first box of Samoas is nearly finished. Local friends must come over and help demolish the second box :) Yum! My sweet tooth thanks you kindly Annie! Yesterday, I received a wonderful package from Julie over at Stoneview. 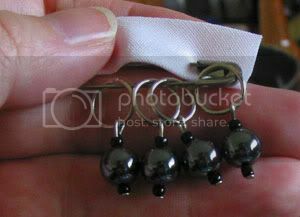 After all the discussion of stitch markers on the RAOK list, she sent me a lovely set of hematite stitch markers! Lookie!! I can't wait to put them on my next project! Thanks Julie. I received it in the mail today, and it's soooo yummy! It's beautiful soft single ply (38% silk, 30% wool, 20% kid mohair, and 12% acrylic). It's called Piazza Navona by Baruffa. It's so lovely! I'm thinking either a scarf or a hat with this wonderful yarn. Thanks so much Elizabeth! Wow your handspun looks just fabulous. Love the colors!! 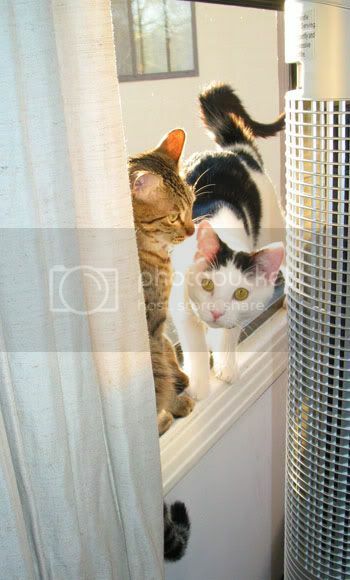 The kitties are just great at that window. It looks like your kitties have become fast friends! 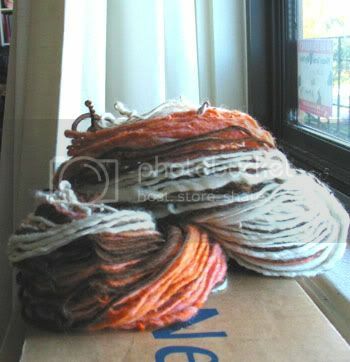 Wonderful colors on your handspun. The kitties are quite cute, fast friends already!